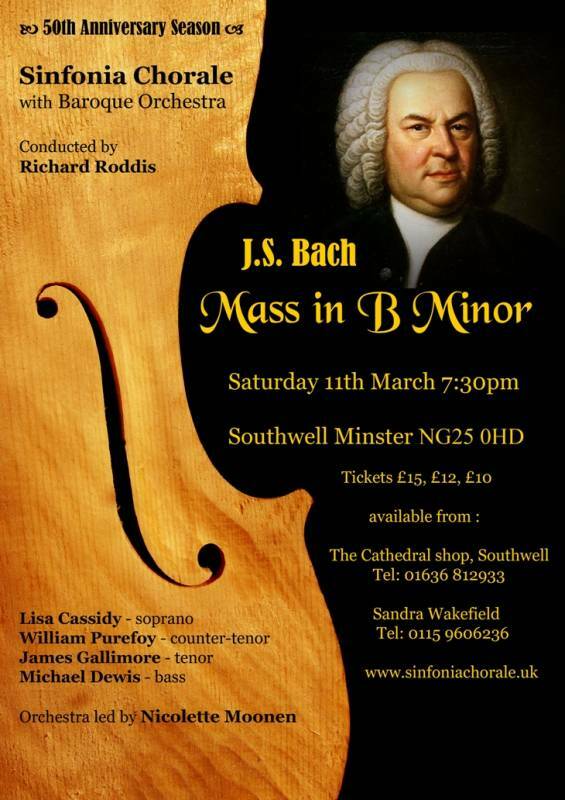 Sinfonia Chorale’s 50th Anniversary Concert on Saturday 11th March at 7.30pm in Southwell Minster certainly lived up to expectations, and the performance of Bach’s Mass in B Minor - a monumental composition which never fails to inspire the listener - was indeed one of the highlights in the musical calendar for 2017. The magnificent line-up of soloists along with the Baroque Ensemble (Leader Nicolette Moonen) together with our Conductor Richard Roddis, ensured the evening was one to remember for years to come. Hopefully this selection of the many comments received conveys the appreciation of all who were involved - both the audience and performers alike. A detailed review written by Choir Member Sue Jolly is available for perusing on the Sinfonia Chorale website.